Pledge $10 Contribute $10 and you will receive a virtual shout out & handwritten thank you note from me plus keep you in the loop with updates. Contribute $15 an you will receive a handy dandy wick dipper to extinguish your candles quickly & safely. Free Shipping within the USA! MANASQUAN, NEW JERSEY, UNITED STATES, June 15, 2015 /EINPresswire.com/ -- “To Infinity and Beyond,” is Janine Predmore’s favorite quotation from Toy Story, and her motto for “Things that Make Scents.” She is the CEO, CFO, COO and any other initial type titles for her small company. 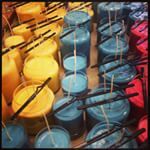 She and one employee currently hand pour nearly one hundred soy candles daily. Why soy? Because in spite soy being finicky for a candle maker to handle, it is clean burning and comes from a renewable resource. It burns cleaner than paraffin and similar types of candles, which means that you can enjoy a romantic candle light dinner without breathing pollutants or smudging your ceiling. Soy wax is biodegradable, and there are no known toxins in the raw wax. It has a lower melt point than other waxes (hence the part about being finicky to work with), and it is non-carcinogenic. Since it is made from soy, a bean plant that can be grown in one season and that actually enriches the soil it is planted on by adding nitrogen, soy candles are good news for just about everyone.